Here are a few pictures from the last couple of weeks! So the theme of being in Japan is that things change constantly, and quickly. Some of the stuff I mentioned I was going to be doing in the last post never actually happened and some other things did happen. Going to Tokyo was a little too last minute and getting people together was hard, so the idea got axed. We still have two more weekends we could potentially go though. It might actually be a better idea to wait, since the weather will be a lot cooler. You know you’ve been in an abnormally hot climate when the temperature is 74 degrees and you feel compelled to put on a long sleeve cardigan and jeans. While walking around you get chills and think to yourself that it’s actually cold outside. The weather the last two days has been like that. Granted it’s been rainy and overcast, but gorgeously windy and cool. It’s hilarious to think that back home when it used to hit 74 I would think it was really hot outside. Needless to say I think I got conditioned to the weather really quickly. After being a sweaty mess constantly for the last few weeks, I love being able to walking around in pants and a long sleeve shirt. Last weekend was pretty busy for most of the international students. It was our first long weekend so most people went out and explored. While I didn’t do anything big I still went out around the area. Friday night a ton of people went out to an izakaya downtown. An izakaya is what bars here are called if they serve food and alcohol. The place we went to had food and drinks for 300 yen. Most places to go to are located in downtown Hirakata, including the train station as well. We almost always take the bus to get downtown because it’s easier and quicker. However, all the buses and trains in Japan stop running at 11, so on nights that we stay out late we make the 30 or so minute walk back to the dorm. Most of the walk is fine, but there is a huge hill that you have to walk up. Also keep in mind that most roads don’t have sidewalks so you spend most of the time almost getting hit by cars. The people here are accustomed to it and can avoid us but it doesn’t stop being strange that your only inches away from cars flying past you. This is walk that Peter, Tim, Jess and I all made the first time we came to Hirakata back in August. At the time it was almost a 100 degrees outside and I hadn’t walked, much less exercised, in a really long time. I think I wrote about that walk being absolutely excruciating. Now it doesn’t seem like anything. People in Japan walk everywhere and I’ve gotten accustomed to doing the same thing. I’ve also lost weight by doing so. Eating different food, smaller portions and walking constantly has made me feel better than I’ve felt in a long time. I feel healthier. It doesn’t stop me from missing my car any less or the convenience it provides, but it helps me see things from a different perspective. I hope when I come home that I can stay motivated enough to make sure I keep walking and running everyday. Saturday I went into Osaka with my roommates. I had been hearing about a place called Sweets Paradise from a few people. Any one who knows me, knows I love desserts. Sweets Paradise is an all you can eat sweets restaurant. They had some pasta and savory food too, but the main highlight is obviously the desserts. I loaded my plate up with all the dessert I could manage to eat and it was amazing. The funny thing about desserts and sweets here is the taste. While it still tastes amazing, it’s not as heavy as desserts are back home. They definitely put less sugar in them, which makes it harder to stop eating since you don’t feel like it’s as bad for you. After that awesome experience, we scoped out the Pokemon Center for two of the people I was with. A new Pokemon game was released that day so they were giddy about buying it. I haven’t actually played any of the games except for the first two, red and blue. So I didn’t recognize any of the Pokemon there other than Pikachu. After some decision-making, some of the group decided to head back to Hirakata. Jenna and I took a train to meet up with Tim, Jess, Kayo, Samara and some other people in Shinsaibashi. Shinsaibashi is the shopping district in Osaka. Walking around there made for really interesting people watching. Being in Osaka is a totally different experience than being in Hirakata. When I stayed in Osaka when I first came to Japan it wasn’t in a very big part of the city, so I never experienced exactly what the downtown area felt like. We spent a long time just walking around and doing a bit of shopping. There was a gigantic electronics store that I did not want to leave. There were walls and walls of video games. There is another place in Osaka called DenDen Town that is the electronics district, so I decided to hold off buying things until I go there and check out what they have. We ended up walking into Amerika Mura, also known as Amemura, as well. Other than Kyoto, I’ve yet to see this many foreigners in one place. It was packed and had some of the strangest stores and clothing I’ve seen in Japan. There were also some expensive designer stores randomly placed around the street. We found the main part of Shinsaibashi, but we walked through it pretty quickly. Our goal was to reach the enormous H&M at the end of street. I’ve never been in a store with so many people. Even on days at Apple when you could barely walk, it didn’t compare to this. The dressing room lines were INSANE and took forever. In the end I didn’t buy anything since I figured I could get most of it easily back home. Shinsaibashi is a really big part of the city, so I only got a glimpse of what there is down there. Just like Kyoto, I’m sure I’ll go back there more than a few times to just to be able to see all there is. After that point, it was dark out and it had been a really long day for most of us, so Jess, Jenna, and I headed back to Hirakata while the rest of group stayed to go to clubbing later that night. Jess and I decided to get Yakiniku from a place downtown called Toriki. All in the all the two days were good, if not tiring. Since this post is already pretty long I’ll end here. Since the next day, Sunday, was easily the best day I’ve had in Japan so far. So it has been a while since I wrote anything! There is always stuff going on and things I could write about but I just couldn’t find the motivation to actually sit down and type anything out. Right now I have an hour break before ceramics class, so I figured there is no better time! Obviously classes have started. One thing I will say is that is I have never voluntarily taken a 9am class. Yet here I have 9am classes three days out of my week, and it’s rough. I have a hard time waking up and convincing myself to get out of bed. I did end up getting into Japanese 3 for speaking and reading. At first I thought the speaking class was going to be rough, but I actually like that class better. My teacher for reading and writing is nice and seems fun but the class itself isn’t. I think it’s mostly because I dislike reading out loud. My other two classes are Ceramics and Monsters and Ghost and the Making of Modern Japan. Jess, Tim, and I all are in the Monsters class. So far it’s interesting, if lacking a little bit of focus. The unfortunate part is that somehow I end up being crazy tired every time we have class because it’s after all the 9-11am classes. It can be a fight to stay awake. My favorite class is Ceramics. My teacher is honestly amazing. He speaks around eighty to ninety percent Kansai-Ben Japanese. It’s helping my listening out so much. Also some speaking here and there. I have class every day except Thursday for 2 hours. It’s nice to have something to focus on, and I really like being creative and making whatever I feel like. Classes mostly keep me busy during the week since we always have homework and quizzes for Japanese. But the weekends are when most people get out and do stuff. I’ve been eating at various places around the city. I can easily say that the food will be the thing I’m going to miss the most when I leave. I cannot get enough of it. Granted there a still a few places back home to get Japanese food, but it doesn’t compare to the food here. There should be stuff to write about after the next two weeks. Monday is a holiday, so we get a long weekend. I had originally wanted to go to Tokyo, but the plan turned into going next weekend since we also get Thursday off next week. We’ll hopefully take a night bus there Wednesday night. This weekend I get to meet my home visit family. I’m pretty excited for it, if not extremely nervous. I got to meet the Kansai Gaidai student whose family I’m meeting. His name is Kazu and he’s 18, which makes me feel way older than I’ve felt since getting here. But he’s nice and his english is pretty good. Oh, I also never got to mention that my roommate is also Japanese. She is awesome and we always have the most random conversations. She’s helped me out a ton with my speaking since I feel confident speaking around her almost all the time. This post was mostly to attempt to catch up with everything that’s happened in the last few two weeks. It feels like I’ve been here for longer than a month. But at the same time I can’t believe a month has already gone by! I have a feeling by the time I leave it will probably feel like everything flew by. So yesterday was filled with more orientations and things to do. I realized that they tell us the same things in all the orientations. The basic message is, ‘go out and have fun just don’t get drunk and act like idiots. And don’t be loud in the streets but we know you will do all of these things anyway because you are loud obnoxious foreigners’. Maybe not exactly like that, but they are heavily implying it. It’s mostly funny, but they are being serious because there are over four hundred exchange students here this semester and things can get crazy quickly. We also had our opening ceremony, which has been the nicest thing we’ve done at the school so far. The president of the school made a nice speech, as well as the American ambassador to Osaka and the Australian ambassador to Osaka. They picked an exchange student and a Kansai Gaidai student to make speeches as well. The exchange student did really well. I felt pretty inspired to go out and explore Japan after they all finished. The head of the Japanese department also made a hilarious speech in Japanese. I had to concentrate the entire time but I understood every word she said, and I was really surprised I could. Sometimes my listening isn’t very good if the speaker is talking to fast. But she kept it pretty easy since I’m sure she knew that everyone had varying levels of Japanese comprehension. After that they had the cafeteria set up buffet style with tons of food. They had so many of us packed in there though it was hard to get to the actual food. It was an interesting mix of different foods. There was a chocolate fountain and ice cream machine next to the takoyaki and cold soba. There probably wasn’t any food left after everyone had eaten. Matt had asked if Tim and I wanted to go with him to meet up Shiori, his speaking partner, after the ceremony had ended. She took us to downtown Hirakata where we did purikura and karaoke. 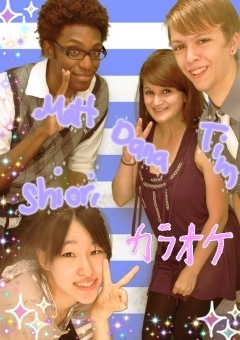 For those who don’t know, purikura is similar to photo booths we have back home. Except the purikura booths here are really popular and everyone does it. Somehow the booth makes your face look different and if you aren’t wearing make up the picture will look like you are anyway. Its hard to explain exactly what makes purikura so different than regular photo booths back home. So instead I’ll just add a picture of one of the purikura we did last night. That isn’t even the most ridiculous one. A few of the others were a little bit hilarious. Shiori only sent me one to my phone so I can’t upload the rest. Next time I go I’ll have to make sure to get them sent to my phone before we leave. After that we headed over to the karaoke place down the street. I’ve never done karaoke before so I had no idea what to expect. The other three jumped right into it and had no problem singing. I suppose it’s because I’ve never sang in front of other people, but I got super nervous every time I was suppose to sing. I ended up singing some korean songs too since I tend to know more korean pop songs than recent japanese pop. We ended with a hilarious group rendition of Arashi’s Love so Sweet. Maybe next time I go to karaoke I’ll order a beer or two to calm down, haha. Maybe it will improve my singing. Even though we had ate a ton of food after the ceremony earlier that day, we decided to get dinner anyway. We went to a place that has a ton of grilled meat on skewers called Toriki. It was amazing and delicious. Every time a customer would walk in or leave the staff would yell uproariously. Anytime someone ordered and they put in the order in, they’d yell uproariously. It gave the place a really interesting atmosphere that made us jump every time they’d yell out. We ordered a ton of food and ordered even more after finishing the first round. Tim decided to be risky and order fried chicken hearts. He said they tasted like chicken but I couldn’t bring myself to try one. Today should be fun too. We get our course confirmation finally! I must have gotten into the ceramics class since they gave me an invoice for the course materials yesterday afternoon. Also here is to hoping I did indeed get into Japanese 3! Later today is also the Kyoto tour the school takes us on. I’m debating on whether or not I should take my dlsr instead of my lumix since I know the stuff we’ll see there is dslr worthy. Oh, I had completely forgotten about the festival we went to on Sunday. It was in downtown Hirakata and it was PACKED with people. There were booths everywhere and people playing random music. We didn’t stay for very long but it was interesting to see nonetheless. Here is a video I took of an old man dancing to this random band singing half in english half in japanese. So even though orientation week isn’t over yet, the last few days have been filled with a ton of things to do. Since I got to the dorms early, I was scheduled to do most of the pre-orientation activities the next day. Which was the chance to get most of the main orientation requirements done so I didn’t have to worry about them during the week. I had my language lab orientation and banking session on Monday. The language lab was pretty straight forward and simple. After it was over there was a campus tour that Jess and I opted out of. We got food from the cafeteria and then went to the banking session. I had heard that this was the most frustrating part of orientation and it definitely lived up to that expectation. All of us EMU kids had to open a bank account since we get a meal stipend from Kansai Gaidai. The bank forms require you to write your name and information exactly like it is on your passport and to sign exactly the same way every time. Needless to say there were people who had to rewrite their forms. I had to do a few over as well. They said they will check over them this week and if we get a slip in our mail box from them it means we have to do a form over again. As of today I haven’t seen anything in my mail box from them so I’m hoping my forms were okay. Tuesday was my placement exam. The listening part was terrible because you only had one chance to listen and it was pretty fast. Most people I’ve talked to said they didn’t do well on the listening so I’m not really too concerned. The next part was a hiragana and translation test. I tried to translate as much as I could. Next was the main test. It was multiple choice and actually pretty easy. There are five sections labeled A,B,C,D,E and you take different ones depending on how many years you’ve studied. I did A,B,C, and maybe three or four questions into D. I’m hoping to be placed in Japanese 3. I feel pretty confident that I will make it there. I’ll know by tomorrow. I met up with Samara and Matt after paying for my fees and we got lunch from the cafeteria again. Let me just say that the cafeteria food is actually good and really cheap. I’m thinking I’ll probably end up getting lunch there a lot. After, Samara and I went to get my cell phone. They were out of the white one since all of the students here are getting the same phone, so I ended up with black. It’s a decent phone and as long as it sends messages and calls people I’m happy with it. Matt had his language lab orientation so we waited for him to finish then went in search of a bike shop. I ended up paying around $65 for my bike. Matt payed a bit more since he is tall and had to get a bigger bike. Biking makes getting around Hirakata much easier and a whole lot faster. I will say that it is kind of hard to ride since the streets here are so narrow and there are always people walking on them. Apparently students get hit by cars pretty frequently here. I’m going to aim to avoid being one of those people. That night all the rest of my suite mates checked in and we all spent some time in our common area chatting. One of the girls had both of her suitcases sent to Hawaii so she was without clothes. We all told her she can borrow what she needs from us. Hopefully her stuff will show up soon though. It was my nightmare and biggest worry that my luggage would go missing when I got here, so I can sympathize with her. Today was busy as well, as we had a general orientation this morning at nine thirty. There were two more orientations later on in the day for the faculty introduction and a sessions on safety in Japan. The safety one was done by one of the english teachers and ended up being fairly amusing. How much of what we learned will be practiced by the international students is yet to be seen though, haha. I also checked my mail box at school and low and behold I was assigned a home visit family! I had thought my application for it didn’t get submitted because of some errors I had sending it via email. But it went through and I’m super happy it did. I got a sheet telling me about my family and a note from their son who is a Kansai Gaidai freshman. I get to meet them tomorrow at the school. I am super excited, but also very nervous. I hope my Japanese can rise to meet the challenge. Either that or it’s going to be stretched to the limit. Tonight we went out to a placed called Gusto for dinner. It was a bizarre mix of food from random places. They had Japanese food mixed in with Italian and Mexican. Their desserts were also really, really good! According to Tim though there is a place in Osaka called Sweets Paradise that is all you can eat desserts for ninety minutes. I may or may not die from sweet overload if I ever go there. All in all it’s been an interesting couple of days. There were some good times, and then some not so good ones. I’m not sure if it’s culture shock or just getting adjusted to being on a campus with a ton of students. Either way I’m making the best of it!